Q: Who is eligible, and how do we register? A: Physicians from any GI Office, Endoscopy Unit, ASC, or hospital. Facilities can register and submit payment electronically or by completing the registration form and submitting payment via mail or fax. Credit cards and checks are accepted. A participating site agreement will also be required in order to register. A: The annual registration fee for a facility includes the cost of a site license for the registry software. The variable cost associated with the specific number of physicians at a site is not as significant as the fixed cost of a site license fee. It is recommended to have one data manager per every 10 physicians. If your facility has greater than 20 physicians, please contact us. *Participants in ASGE’s Endoscopy Unit Recognition Program qualify for discounted GIQuIC rates. Q: How is a "site" defined in a complex hospital system where there is a main hospital, yet several major satellite sites where colonoscopy is also performed - would each physical site be its own entity? Or would the "site" include the main hospital and all of its additional sites? A: These would all be specific individual sites but an organization with multiple individual sites will be able to roll-up their data to get an organizational report. Q: How can I publicize our practice involvement with GIQuIC and overall commitment to quality in patient care? A: Your facility will receive a certificate that indicates your participation in GIQuIC and your overall commitment to quality in patient care. You will also receive marketing materials that explain the meaning behind your participation in GIQuIC and a PR/Media Toolkit to help publicize your facility’s involvement with GIQuIC. Q: How does this registry compare to other registries and quality improvement programs? A: The GIQuIC registry is based on real-time clinical data which more accurately represents clinical performance. Participants (physicians, hospitals, ASCs, physician offices and endoscopy units) are able to run a myriad of customizable reports from the registry based on this real-time clinical data, benchmarking against local, regional or national cohorts. 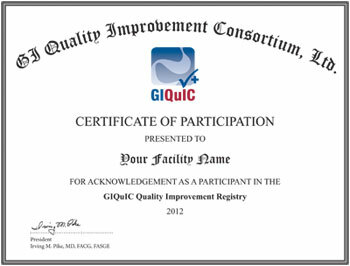 GIQuIC is a Qualified Clinical Data Registry (QCDR) so participants are able to report quality measure data to CMS. Participants will be able to perform peer-based evaluation and quality improvement, identify gaps in care and address those gaps, all requirements of accrediting bodies. The data could be used for clinical outcomes research and quality initiatives. The result of documented performance improvement and quality participation could set the stage for improved reimbursements through Medicare and other insurance companies. Q: Is an endowriter required to participate? A: No. Facilities not using an electronic report writer will be able to submit data via the GIQuIC internet portal. Q: If we use an endowriter will their software be compatible with the registry? If you wish to participate in GIQuIC, contact your electronic report writer representative and let them know. The representative should be able to show you how your endoscopy report writer can capture the data necessary for transmission to the GIQuIC registry. Please note additional fees may apply from your endowriter depending on integration requirements. If you use an electronic report writer not listed above, Please contact us. Q: What data will be collected for benchmarking? Defining and Measuring Quality in Endoscopy. Am J Gastroenterol 2015;110(1):46-47. QualityIndicators Common to All GI Endoscopic Procedures. Am J Gastroenterol 2015;110(1):48-59. Quality Indicators for EGD. Am J Gastroenterol 2015;110(1):60-71. Quality Indicators for Colonoscopy. Am J Gastroenterol 2015;110(1):72-90. Click here to view samples of the Colonoscopy Data Collection Form and EGD Data Collection Form. Q: In the "Adequate bowel prep" field, how is "adequate" defined? A: Adequate is defined as the prep is adequate such that the examiner is able to identify polyps of > 6 mm size or larger. These types of definitions will be provided so that it is clear what should be entered for each data point. Q: Do facilities have to report in all data collection fields? i.e., could a facility submit data but not include height of pt? A: There are a few fields that will not be required (i.e. height and weight). These data requirements will be conveyed during the training tutorial. Q: Approximately how much time will be involved on our end with preparation of the data we will be sending to you? A: The submission of data will be accomplished electronically for those using participating endowriters. If you do not use an endowriter, then a streamlinedinternet/web interface is available. Those using endowriters will use a direct interface to upload data directly from their endowriter to the registry. This will be done as a batchload and will upload a month’s worth of data in a few minutes (or as frequent batch uploading as you wish). Entering data using the format for non-endowriter facilities will take an estimated 90 seconds per procedure. Q: How frequently should data be submitted to GIQuIC? A: It is up to the discretion of the site as to how often they wish to submit data. If pathology tissue is obtained, the data for that case should not be submitted until pathology is returned, as the polyp findings are part of the data that is collected in GIQuIC. It is recommended that cases are submitted in batches versus each case one at a time. For example, a site might choose to submit a week’s worth of data at one time, or two week’s worth, or even a month’s worth of data at one time. Q: What is the role of the data manager at the site and what type of training will they receive? A: Training will be provided to each facility’s Data Manager, who will be the point person responsible for uploading data to the registry. This Data Manager Workflow document provides an overview of their role. An online training tutorial is provided and can be completed at the data manager’s convenience. There will also be help desk support for all participating sites, and quarterly live web training from Outcome Sciences. Q. What will GIQuIC do with the data? A: GIQuIC will use the data to help further the goal of improved patient medical care, which may include general educational and research purposes. GIQuIC will not, in any way, use the data contrary to applicable federal or State laws, including laws with respect to the privacy of medical information, or that discloses information attributable to specific, identifiable patients or physicians. Q: Is my data secure? Are groups de-indentified? A: Yes, all data in GIQuIC is encrypted and stripped of any personally identifiable information – physician and patient data. Q: What measures will be included in this registry? A: The program reports on 11 colonoscopy measures and 12 esophagogastroduodenoscopy (EGD) measures. Q: Is GIQuIC a QCDR for the purposes of reporting to the Physician Quality Reporting System (PQRS) for the 2016 reporting year? A: Yes, GIQuIC is an approved QCDR for the PQRS 2016 reporting year.To learn more about GIQuIC and QCDR reporting please visit our PQRS page. This page includes detailed measure specifications, a recording of an informational webinar, and FAQs specific to PQRS reporting via GIQuIC. A: Participants will be able to obtain reports on-demand that enable them to compare their performance to the other providers within their group, compare to the aggregated performance of the entire GIQuIC registry (aka the study), and compare to the established performance targets, as available. Standard reports for established performance measures are available for use, and further, participants can create reports at will using their own data that can be readily retrieved from the registry. Q: How long after data submission until the reports are available? A: Once data is entered in the registry a facility can begin to generate reports immediately. Q: How frequently will reports be updated? A: Reports will be updated “real-time” when data is entered. Q: Are we able to create reports based upon our individual physicians and group as a whole. A: Yes, the reports can be generated by physician or by facility as a whole. Q: Please describe the procedures that cover the physical computer security (e.g. room access, fire, flood, etc.)? A: All servers used to host customer/site applications are housed in a commercial co-location facility. These facilities provide access control, fire protection, power conditioning, backup power (UPS and generator), High-speed internet access, cooling and hands-on assistance when needed. Access to these facilities is controlled by access lists, key cards and biometrics. Q: What browsers can be used to access the Enhanced Web-based System? A: The suggested browser is Internet Explorer 7.0 or higher, but the following additional browsers are also supported: Firefox 2 or higher, Safari 3 or higher. A: All of Outcome’s solutions are fully privacy compliant and mesh seamlessly with an organization’s existing privacy protocols. Outcome has worked closely with the ACS to ensure privacy compliance, such as the Health Insurance Portability and Accountability Act of 1996 (HIPAA) and the EU Privacy Directive. Q: Does the Outcome system meet HIPAA requirements? A: Outcome uses encryption to protect data “in motion” as it travels from point to point over the internet. This encryption is done using secure sockets layer and bit key applications sufficient to render the information travelling over the internet as “unusable, unreadable, or indecipherable to unauthorized individuals” consistent with HIPAA and the HITECH Act. In addition, Outcome utilizes secure, off-site hosting facilities that are monitored 24x7x365, with access controlled by security personnel and/or biometric security systems. The above steps meet or exceed federal requirements for information security and privacy and are consistent with industry standards for data privacy. A: ActiveX is not required. Q: How is access to the system maintained? A: Access to the Outcome system is based on defined user roles. These roles determine the specific menus, tasks, and information to which a user has access. By integrating this technology with standard procedures for user definition, password selection and updating, and other features, we can prevent unauthorized access to the study and secure information. Outcome’s security standards meet or exceed those established for privacy protected and/or other sensitive HCFA information sent over the Internet. Q: How are the systems access controlled on the server and client workstation including encryption method, capability to view passwords and password integrity? A: Systems are accessed via individual username and password. Passwords are encrypted at the browser using a DES encryption key and transmitted to the server where they are compared to the encrypted password stored in the database. The communication of the encrypted password is secured using SSL. Passwords are never visible in unencrypted format. Q: Are environmental conditions monitored seven days a week, 24 hours per day? A: The data centers are manned and monitored 24x7x365 by employees of the data center provider. This includes access and environmental conditions. Q: What is Outcome’s system back up procedures? A: All databases and application code, configuration files, and artifacts are backed up nightly and transmitted by private network to Outcome's central data facility in Cambridge. Data are backed up to tape and archived by a nationally recognized archival vendor. A: Outcome focuses not only on collecting but also on securing data. Outcome offers a secure facility and failover processes to keep your data safe. Outcome maintains system security through both physical and logical methods. Databases are maintained in a secure, access controlled and monitored facility. The mechanisms employed are in-band processes (encryption, authentication, and intrusion detection), out-of-band processes (user identification, secure storage and back-up, data redacting, and non-modifiable audit trails), and system redundancy. Additionally, an external assessment of system security is routinely performed by an independent, expert third party. Q: How is disaster recovery setup (Hot, Warm, Cold or Other)? A: It depends on the point of failure, if the App server or Instance fails the recovery is warm, if the database fails the recovery is hot (clustered oracle).